Many a playground argument was due to these guys. I was awful at them. They were so ugly. Basicaly the 90s version of loom bands. 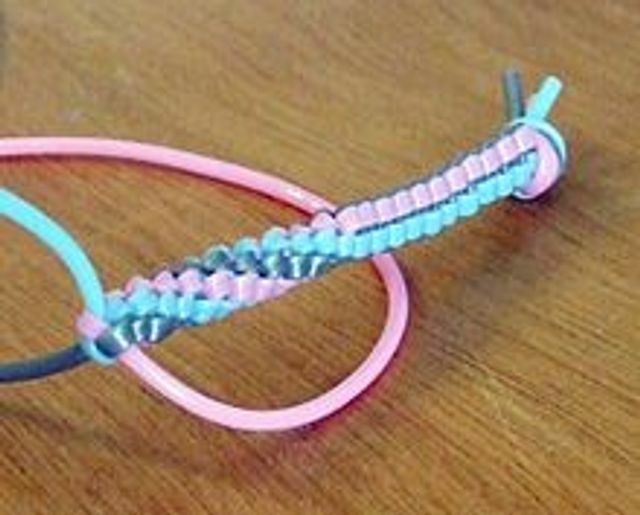 Scoubidou (Gimp, Lanyard, Scoubi, Scoobie, Boondoggle, or rex-lace) is a knotting craft, originally aimed at children. It originated in France, where it became a fad in the late 1950s and has remained popular. It is named after the 1958 song of the same name by the French singer Sacha Distel.